Dragon Ball Xenoverse 2‘s next transformation has been revealed. A free-to-play lite version that will be available later this week. This free version of the game will be launching on March 20, 2019 for PS4 and Xbox One. You get five story episodes in Dragon Ball Xenoverse 2 Lite Version. The idea is to give you a taste of the main campaign. This means you get to experience Raditz’s Attack, The Saiyan Threat, Ruckus on Planet Namek, The Ginyu Force Strikes, and The Galactic Emperor. However, that’s not all, incoming Z-Warriors. You can fight in online battles and online quests with both those who do and don’t have the full game. Some restrictions are in place though, as online events and expert missions have been locked off for lite users. If you decide to pick up the game, you can carry over your progress to the full version of Dragon Ball Xenoverse 2. If you haven’t got enough Zeni to buy the game, Hero Colosseum is also open to you. It’s a mode in which you collect figures in a gacha system (like a loot box) and then battle them against AI or online opponents. Each figure has its own stats that you can level up and skills that you can equip before sending it to fight. Hero Colosseum has its own additional stories, as well. According to a previous V-Jump article, Parallel Quests, Photo Mode, and My Raids will be included in the lite version. 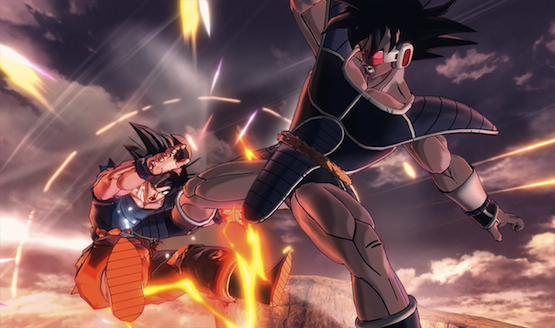 Dragon Ball Xenoverse 2 is the latest game to go free-to-play in 2019, following Dissidia: Final Fantasy NT and Dead or Alive 6: Core Fighters. Will you be giving any of these titles a try?